Although I was very busy towards the end of the year I managed to download for free, knit and crochet the gorgeous Small Triangular Shawl by Jennie Atkinson. 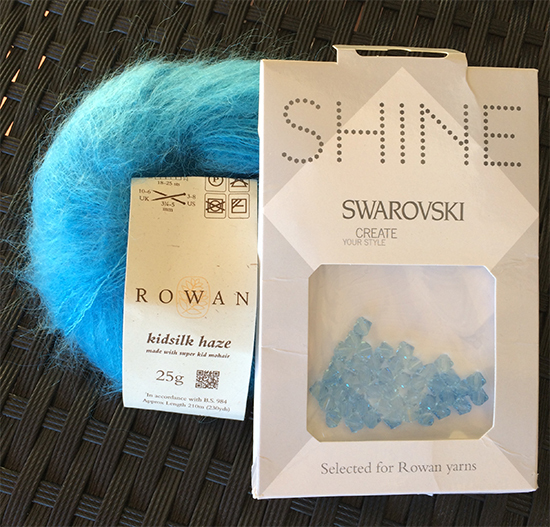 If you read my last blog, you may remember that Rowan and Swarovski have joined forces and produced a new range of yarn, designs and tailored crystal packages called “Shine”. For this Small Triangular Shawl you only need one 25g ball of Rowan Kidsilk Haze and 49 x 6mm Swarovski crystals. 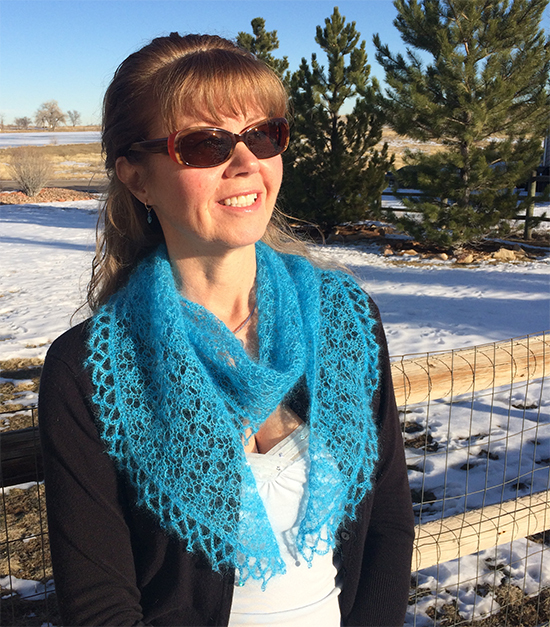 I made my shawl in the beautiful bright blue shade Atlantic (discontinued now) that was in my stash and was lucky enough to have received a pack of the Swarovski Aquamarine Selection crystals from Rowan. Perfect! 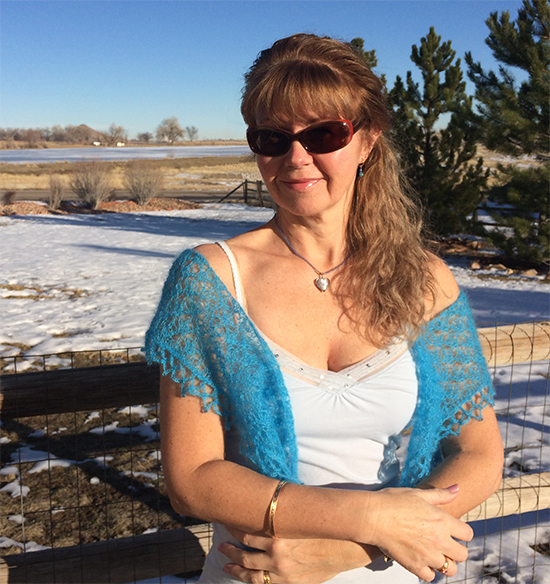 It looks cold out there but the Coloradan sunshine kept me warm! Of course, there are so many shades of Kidsilk Haze to choose from, 41 to be precise, and you don’t have to add the crystals if you don’t want to. 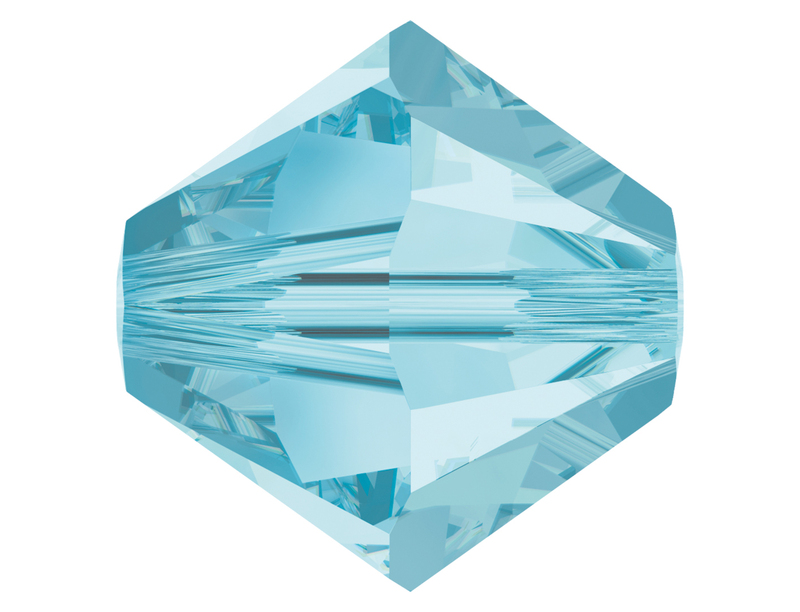 The 6mm Swarovski crystals sets that go with this shawl are available in 5 different colours: Aquamarine, Black Diamond, Classic Crystal, Light Colorado Topaz and Violet. The pack of 50 crystals cost around $19.95 (£14.95). 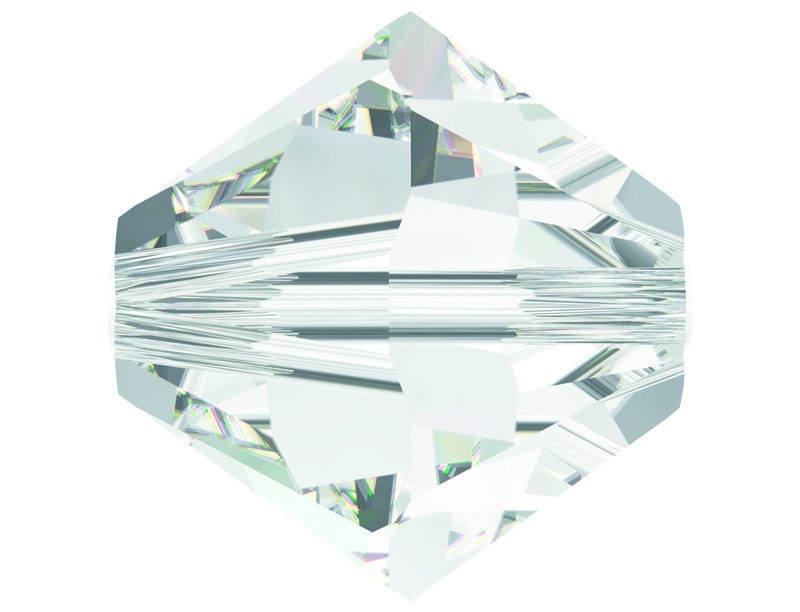 You can of course buy cheaper crystals but if you want the best, Swarovski crystals are recognized worldwide for their brilliance and intense sparkle. I have used them for many years making earnings and necklaces. The lace stitch is fairly straightforward and once you have established the first four rows it is easy to memorize and predict when you should be doing a yfwd or a K2tog, etc. The crochet edge just consists of chains and double crochets with a couple of double trebles here and there (chains, single crochet and trebles if you are a US crocheter). The crystals are threaded onto the yarn just before you add the crochet trim. If you have never knitted/crocheted with crystals and beads, Rowan have released a whole set of videos on You Tube to show you how to thread, knit and crochet with crystals and beads, Check out my links below. Although this shawl is quite a small and just about covers your shoulders it does make a lovely drapey scarf. Wrap it around your neck and let the ends hang down……. or hide the ends underneath so it looks like a cowl. However, looking at the original Rowan photograph it appears that an extra row of crochet has been worked making the shawl a little larger than the pattern states. I’m sure this is possible to do as I had 3g of the 25g ball left when I had finished. 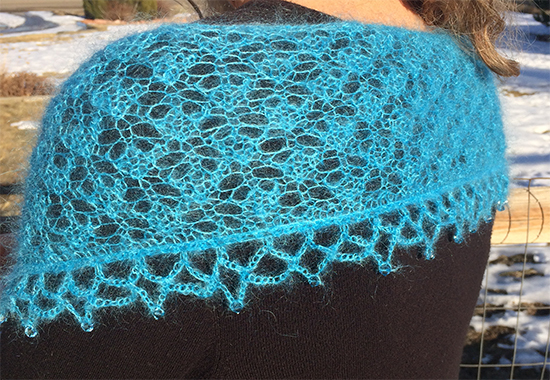 I did think about knitting extra rows of the lace-stitched main section but was worried about running out of yarn. If I made it again I would probably go for another row of the crocheted edge. Alternatively, you could make a larger triangular shawl with Swarovski crystal embellishments like this one also designed by Jennie Atkinson and from the Rowan Swarovski Evening Collection……. You will need 3 x 25g balls of Kidsilk Haze (shade Dewberry shown here) and 147 x 6mm Swarovski crystals. Now for some links to click on…….. Thanks for reading my blog and do let me know if you have used crystals or beads in a knitting or crochet project recently by leaving me a comment below.